For the first time in SV-POW! history, a full week has passed between successive posts — well, at least we didn’t actually fail with the “of the week” part, even if it was a close thing. It’s been a busy week, for reasons that will soon be apparent; and for the same reasons, the posting frequency will ramp right up in another week or so. We usually don’t like to follow one tutorial directly with another, preferring to sweeten the deal by putting out a sheer-beauty-of-sauropod-vertebrae post in between tutorials. But this time, we need to push the tutorial out straight away, because it’s about laminae; and we’re going to be talking a lot about laminae in the next fortnight. You’ll recognise this picture from Tutorial 2: Basic vertebral anatomy; but this time I’ve highlighted and labelled the laminae in red. Now let me admit right off the bat that this looks horrible and complicated. When you see the names of the laminae written out in full — the PRDL, for example, is the prezygadipophyseal lamina — it doesn’t help much, either. But this complexity is an illusion: in truth, laminae are not complex structures — they’re just sheets of bone — and the nomenclature that we use for them is not so much complicated as explicit. One of the nice things about laminae is that they are just about the only anatomical feature that has a single key paper that you can read to learn pretty much everything you need to know. That paper is Jeff Wilson’s 1999 offering A nomenclature for vertebral laminae in sauropods and other saurischian dinosaurs (JVP 19:639-653). Like all Jeff’s publications, it can be freely downloaded from his publications page, [NOTE in 2013: not any more!] so a hat-tip there for open-access publication. (One of these days, an SV-POW! post is going to be an extended rant about the absurd current publication/copyright/access situations … but not today.) Anyway, if you want more details on laminae after reading this post, Wilson 1999 is definitely the place to go — use of his nomenclature is near-universal these days. So here’s how it works. In tutorial 2, we learned about the “landmarks” on a sauropod vertebra — most of which are shared by the vertebrae of other tetrapods: the centrum, neural arch and neural spine, pre- and postzygapophyses, diapophyses and parapophyses. Laminae are sheets of bone connecting one landmark to another. And each lamina is simply named after the two landmarks that it connects. So suppose you have a lamina connecting the spine to the postzygapophysis: that would be a spinopostzygapophyseal lamina. A lamina connecting the anterior aspect of the parapophysis with the centrum is an anterior centroparaphophyseal lamina. As I said, Wilson listed 19 laminae. There are a few others that occur less often and didn’t get a mention in that paper, such as a ?unique spinoparapophyseal laminae on the 7th dorsal vertebra of the ubiquitous B. brancai type specimen HMN SII. But the picture above only shows nine. That’s because of serial variation. 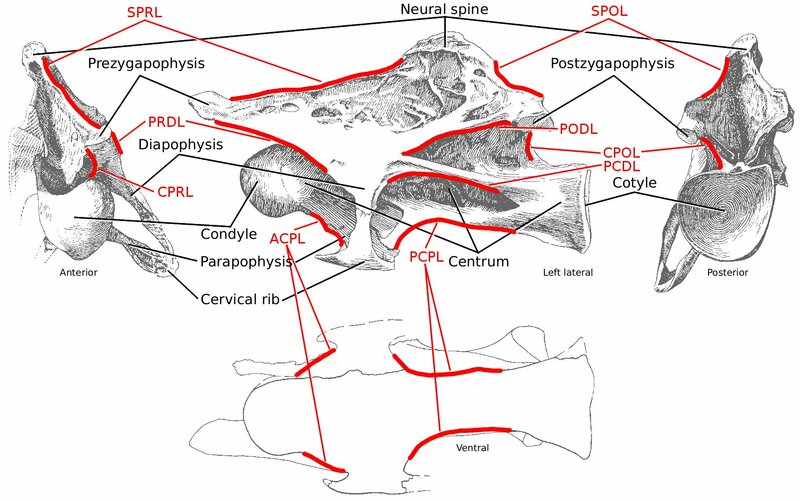 Wilson’s paper figures eight different vertebrae (four cervicals and four dorsals) and it’s apparent as you look at them that different lamina come in and drop out at different points along the sequence. For example, some dorsal vertebrae have a paradiapophyseal lamina that connects the parapophysis with the diapophyis, but you don’t get that in cervicals. One of the ways we can determine which taxon a sauropod vertebra belongs to is by looking at its laminae. That’s all for now, I have to go and watch a Harry Potter film with the boys. Wilson (1999) is no longer freely available, and this tutorial is quite a bit less useful without it as a universally available reference, so here are all 19 of the commonly named laminae and their abbreviations. Did you know that some plethodontid salamanders have vertebral laminae? I don’t think anyone has ever applied a standardised nomenclature to them however..
And, yes, I have lissamphibians on the brain, sorry.